Summit and Sierra, supercomputers at Oak Ridge National Laboratory and Lawrence Livermore National Laboratory, are now ranked the #1 and #2 fastest computers. They are helping us model supernovas, pioneer new materials and explore cancer, genetics and the environment — using technologies available to all businesses. What are Summit and Sierra? In March 2014, the U.S. Department of Energy awarded IBM the commission to build two supercomputers. The mission was to develop a machine 5 to 10 times faster than its predecessor, Titan. 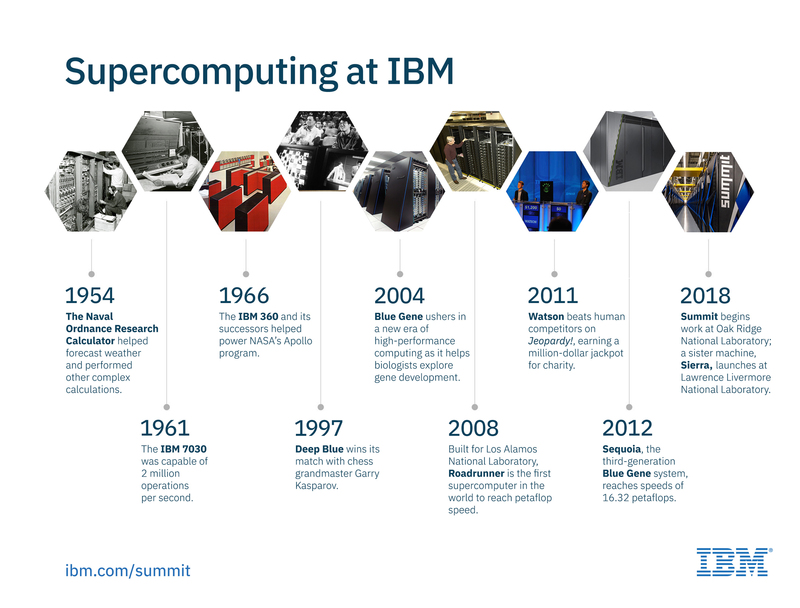 Over four years, the DOE worked with a team of IBMers to break through countless technology barriers to build Summit and Sierra — systems with the brains of AI and deep learning and the brawn of 200 petaflops and 125 petaflops, respectively. One million times more powerful than the fastest laptop, these supercomputers can sift through thousands and thousands of variables and create models and simulations that can help researchers find answers to the world’s most complex problems. Summit and Sierra represent a major shift from how IBM structured previous systems. IBM developed a new computing architecture that combines high-performance POWER9 CPUs with AI-optimized GPUs from our partner NVIDIA — all linked at extremely high speeds and bandwidth. In the supercomputers’ new architecture, compute is embedded everywhere data resides, producing incredible speed and creating a system purpose-built for AI. “By building these supercomputers, we are building the world’s leading AI machines,” says Hillery Hunter, IBM Fellow; Director, Accelerated Cognitive Infrastructure. Another radical shift is that the two machines are built with components available to any enterprise — this technology is part of IBM’s product line, available to accelerate every business. The arrival of these new supercomputers gives researchers a powerful boost in the fight against cancer. For example, machine learning algorithms scaled on Summit will help supply medical researchers with a comprehensive view of the U.S. cancer population at a level of detail typically obtained only for clinical trial patients. Deep learning could help scientists identify materials for better batteries, more resilient building materials and more efficient semiconductors. By training algorithms to predict materials’ properties, researchers may answer longstanding questions about materials’ behaviors at atomic scales. Using a mix of AI techniques, researchers will be able to identify patterns in the function, cooperation, and evolution of human proteins and cellular systems. Greater understanding of how these patterns give rise to clinical phenotypes — observable traits of diseases such as Alzheimer’s, heart disease and addiction — will inform the drug discovery process.